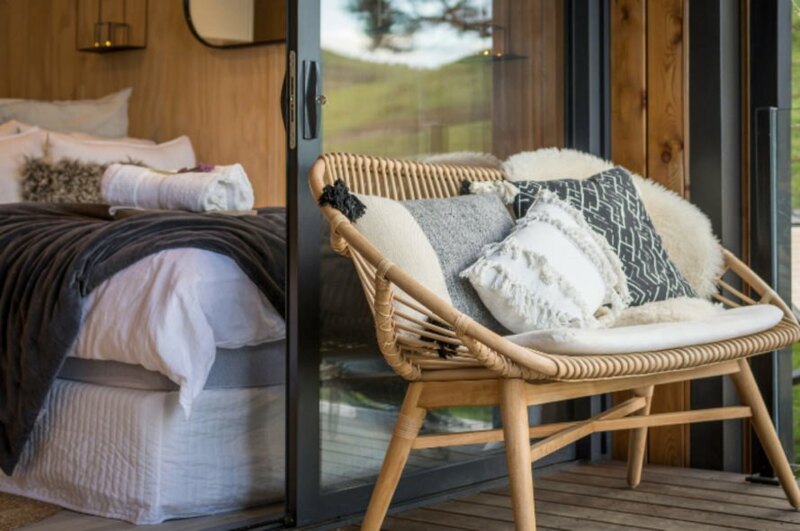 Tiny homes around the world offer guests stunning views and relaxing atmospheres, but this studio-style tiny retreat in New Zealand is right up the alley for anyone looking to reconnect with nature. 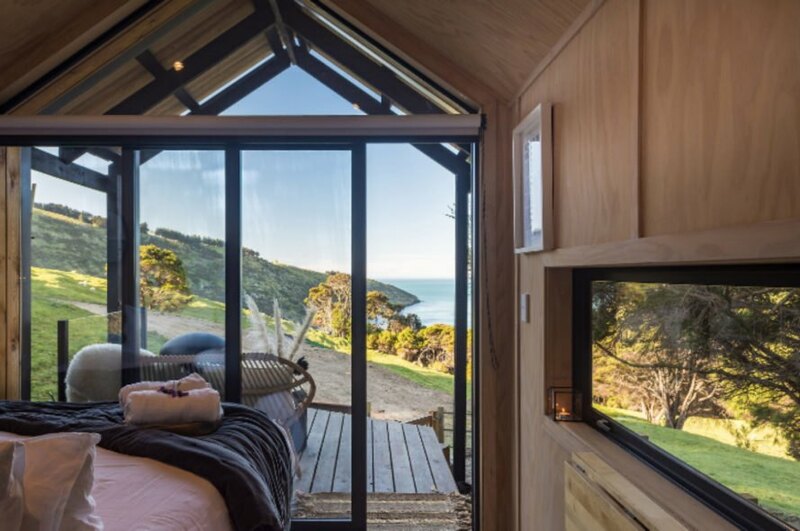 Located in Akara, South Island, the compact, pitched-roof cabin has a floor-to-ceiling glass wall to provide stunning views of the rolling green landscape that leads out to the sea. If that’s not enough, the open-air front patio features a large cedar hot tub for watching the sun go down after a nice day of surfing in the bay. 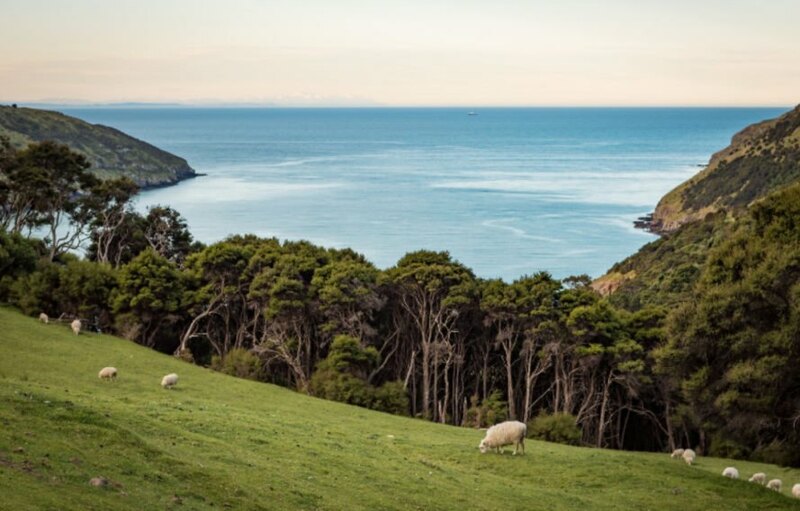 Located just 30 minutes from Akara, South Island, this charming tiny cottage is tucked into a coastal sheep farm just steps away from beautiful Little Akaloa Bay. 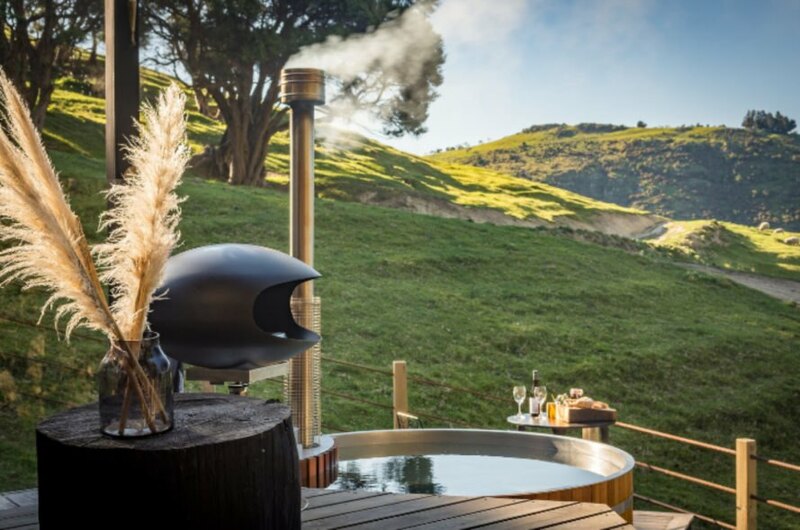 To get to the property, guests must make their way on a five-minute stroll through scenic native bush. Nestled into the tall trees and rolling green landscape, the tiny home is a welcoming beacon. The tiny studio sleeps just two people, with a double-sized bed that folds up when not in use. There is a small kitchenette and bathroom. 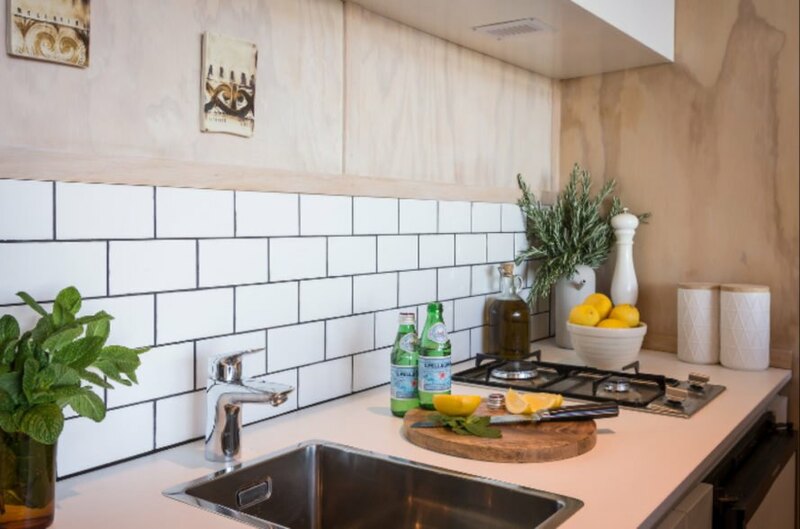 The home is kept warm and toasty during the chilly months thanks to a wood-burning stove. The massive, floor-to-ceiling glass wall looks out from the interior, providing stunning, unobstructed views all day long. Of course, at the heart of the retreat is the outdoor space, which includes an open-air deck. 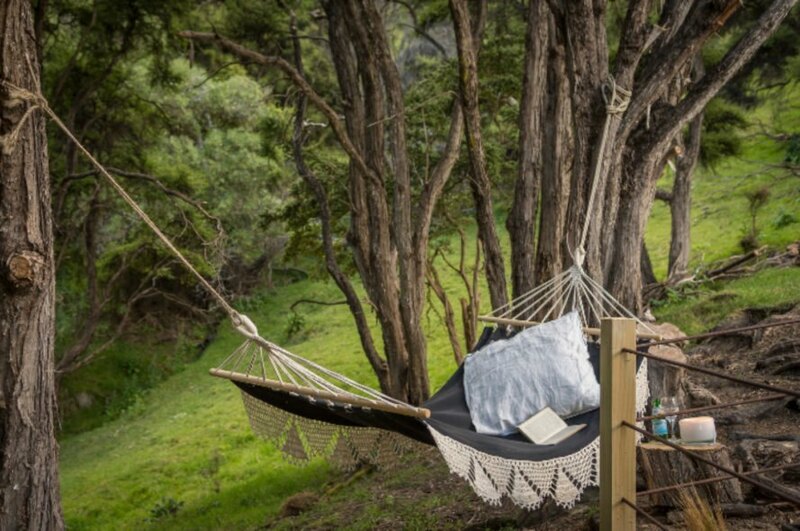 There’s a barbecue grill and small dinette set for meals, as well as plenty of seating and a hammock for just taking in the views. 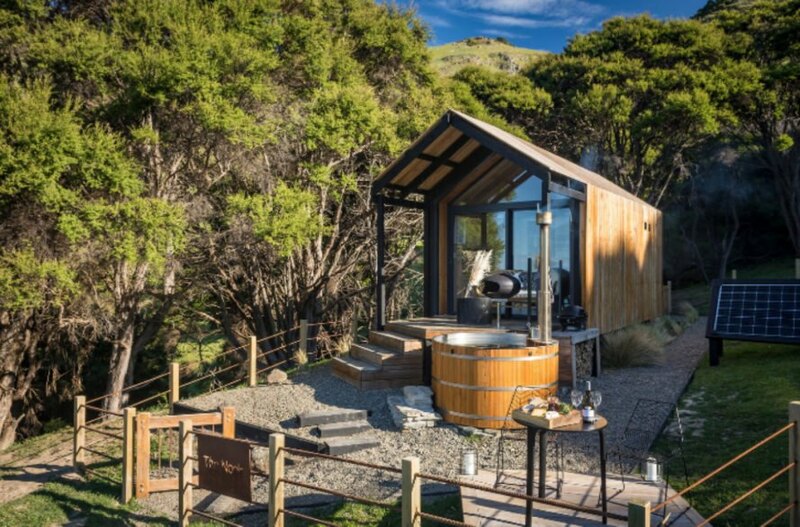 However, the best place to relax in and around the tiny cabin is definitely the round cedar hot tub. The picturesque area is the perfect spot for hikers and outdoor enthusiasts or those simply wanting a respite from the hustle and bustle of everyday life. 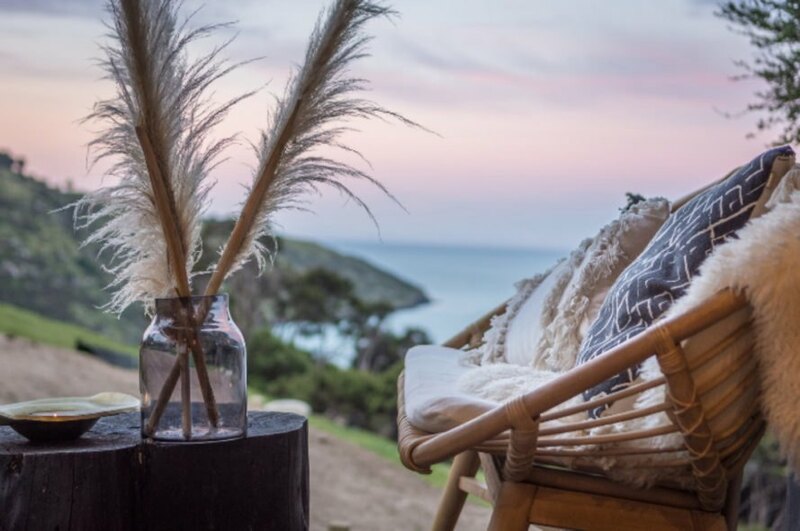 Guests will be able to enjoy the beautiful remote bays that surround the beautiful property by renting the surfboards, paddle boards and fishing equipment available.